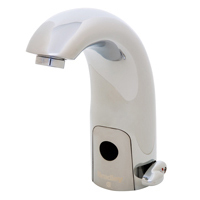 [XPB-S53-32X] Our Aerada Faucet No-touch infrared High Arc IR Faucet is powered by a 6-volt DC lithium battery. All Electronics shall be above deck within watertight enclosure. The external temperature control shall be constructed of solid cast brass and shall comply with ADA guidelines. The faucet shall include a chrome-plated, forged brass body with centershank mounting, .5 GPM vandal-resistant aerator and (2) stainless steel flexible supply hoses. The faucet shall be UPC approved and certified to CSA standards. For shipping quotes, orders or questions please call our Customer Service Center at 1-877-483-9270.